California Academy of Sciences discounts - Hotels Etc. 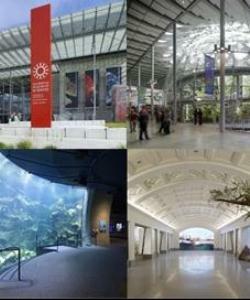 The California Academy of Sciences combines a museum, aquarium and planetarium in one for a full day of family fun. Save 10% on Admission! The new Academy brings the whole universe under one roof - an aquarium, a planetarium, a natural history museum and more! The 412,000 square foot structure is not only physically impressive, but it just may be the greenest museum on the planet, with a 2 ½ acre Living Roof, an expansive solar canopy, an extensive water reclamation system, and walls insulated with recycled blue jeans. The Academy is a masterpiece in sustainable architecture, blends seamlessly into the park's natural setting, and is filled with hundreds of innovative exhibits and thousands of extraordinary plants and animals. Exchange your voucher for admission at the “Service Desk Kiosk”, located at the main entrance (to the far right of the glass doors) of California Academy of Sciences, 55 Music Concourse Drive, Golden Gate Park. *Closed Thanksgiving and Christmas Day.